Gabriel Santiago (hereafter Gabe) is an ID that happens to be in a fantastic state at the time of writing because of Near Earth Hub and Blue Sun, both matchups that Gabe has a very good winrate against, and are currently very popular. Blue Sun did one important thing to Gabe, though, it meant the so called “Ser Gabe” decks (Gabe with the aid of Knights) were no longer a viable idea. Knights are a dead draw against Blue Sun and the idea was already losing enough momentum that Blue Sun gave it the small push it needed. Gabe can keep up with the faster decks of today’s meta (namely Near Earth Hub) whilst remaining strong against other, slower decks, such as HB: Engineering The Future, Jinteki: Replicating Perfection and similar. Gabe’s an old ID now, coming out in Core set, and his playstyle is about as volatile as people’s decklists for him. The metagame is a tough one for runners, and runners like Gabe can find it hard to stay competitive against all of the big Corps. Though Gabe has probably the best matchup against Near Earth Hub if built for it, you need to ensure he doesn’t falter against decks that aren’t NEH. As I’ve said above, Gabe lists have gone through a lot of changes. Consider this list from the Tulsa, OK Store Championship of 2014 (sets legal up to Fear and Loathing). I believe this list is most certainly a product of its time so I’d like to talk about it a bit to explain why it’s less good now. Now what you should note in this deck is just how big of a deal Knight is. To the naked eye it just looks like they’re there to help, but then you realise that Mimic and Yog don’t have Datasucker support and, indeed, can’t break things above strength three. Knights, Femme, or just repeated Shutdown is relied on for Tollbooths and other popular cards. This was, you should remember, back when Komainu wasn’t released and RP wasn’t a big faction, meaning they didn’t weaken an already bad matchup by making you pay double what you should for Komainu and Tsurugi. Back then, you *could* rely on Knight. 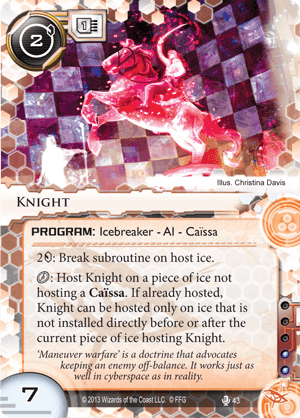 Lists like this were designed mainly to Knight HQ and Indexing was there for when you’d Siphoned them down enough that they wouldn’t be able to rez any of their R&D ICE. If I was to use this sort of list now, I feel like, other than wasting 6 influence and 3 cards if you were against Blue Sun, the amount of multi-sub ICE you’re likely to face is significantly higher (NEXT Silver, Komainu, Tsurugi, Grail, etc), and Knight is… unwieldy to use to say the least, for an often suboptimal efficiency (costing 4 instead of 2 for Architect for example). This was a time before Enhanced Login Protocol existed (which prevents Special Ordering a Knight, moving it, then running) and before Corps were routinely significantly richer and faster than runners like they are now, though, and the vast amount of multi-sub ICE was either not out yet or not good enough to be played much. Most things (other than cards like Paper Wall, which was actually a popular card when it came out) were just as efficient to break with Knight as they were their respective breakers, sometimes even better (Bastion/Grim/Tollbooth are nice examples). There was very little of a liability to running that card in your deck and it was actually a really efficient breaker that regularly meant you could click one Siphon and not worry about anything. As there was no risk, it follows then that you can in fact rely on a card like Knight, which could fill in the gaps in an otherwise efficient rig and get an incredibly efficient rig with a lot of upsides and very few downsides. If you’d play it now, you’d be playing a breaker that’s probably actively hurting you in a lot of matchups, and you still probably want Sucker support and/or non-static breakers (and at that point, why play Knight?). Knight really, realy held this particular breaker suite together and made a nice and efficient rig – but it only worked in that particular metagame; multisub ICE wasn’t a big thing, most things were better to Knight, Blue Sun didn’t exist, RP wasn’t a thing basically at all (and singlehandedly makes Knight look like a joke). Though I doubt it, maybe there will be a metagame in the future where Knight is good in Gabe again, and it can, similar to how we see it in this list, fill in the gaps of an efficient rig. Whether it will or it won’t, I can say for certain that it doesn’t now. 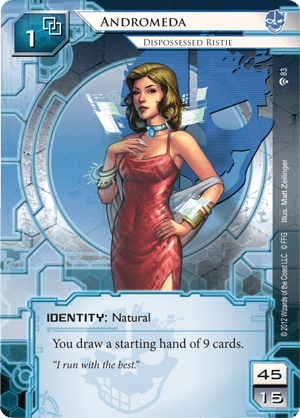 Another card I’d like to draw attention to is Armitage Codebusting – a very solid and common three-of in Gabe decks of the past. This was a time before Security Testing and before Bank Job became solid, reliable economy. 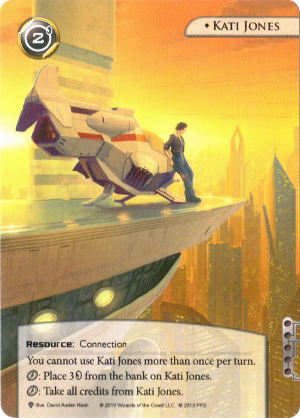 It was the card you turned to when you were locked out of their servers because you didn’t have enough money and didn’t want a turn of “take 4, go”, or just had some spare clicks left you wanted to get money with – there needed to be a bit more money to tide decks over. The reason Security Testing and Bank Job change this is that Security Testing fills in the gap of a steady income (that, like Codebusting, doesn’t like being tagged), and Bank Job fills in the gap of, well, having more money. I’ll go on to talk about Bank Job more later, but all you really need to know is that whilst Codebusting gives you 11 credits over 7 clicks, Bank Job gives you 7 (or 8 with Desperado) over two clicks, meaning you can just click for credits and have more money than with Codebusting, but you probably don’t want to have to. I can see metas in the future where Codebusting may come back, but at the moment, Bank Job feels like just a better version of Lucky Find in Criminal and fills in the role of this secondary econ. Gabe’s obvious ID of comparison is Andromeda. Andromeda arguably has the strongest ID ability in the game, and her first turn setup means she can play builds that rely on pieces, like Stealth, with Switchblade, Cloak, and Refractor, or just standard aggression – namely AndySucker, a build Andromeda is famous for – consisting of, well, Andromeda and Datasucker (alongside Desperado and similar), meaning Andromeda can set up a fearsomely aggressive rig at a consistent rate, too. I know what you’re thinking though – why write a primer about Gabe if you’re going to drone on about Andromeda? I think it’s important to talk about Gabe’s alternatives first – and what advantages/disadvantages he has over similar runners. 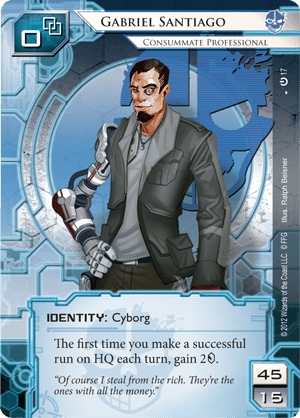 I’m sure if I looked hard enough on NetrunnerDB I could find Andromeda decks which would be better if the ID was Gabe and Gabe decks that would be better if the ID was Andy. You should, obviously, try and avoid this, and that’s why I decided to write this section. Over Andy, Gabe gets an impressive two credits for a HQ run each turn, and can make that into a tasty three with Desperado or five if you’re Security Testing. Over Gabe, Andy has the obvious advantages of consistency and getting set up and ready to rock by turn two. These are things you probably didn’t need me to tell you, though. What this means in a real game is that Gabe has to make a few more riskier runs than Andy (less chance of cards like Faerie), has a weaker lategame, but a far stronger early game. For this reason I’m a big proponent of trying to build Gabe to maximise his early pressure. If you’re making a run on HQ every turn and making your Gabe money off it, you’re probably better off as Gabe than as Andy – hence why trying to extend this early pressure for as long as possible really melds with Gabe’s ID. It’s worth noting that Gabe can be built in a slower way (though I’m not a massive fan myself), with cards like Kati Jones, Mr. Li, and similar to try and give him a better place in the late game. However, these two cards are at odds with maximising your Siphons and mean you can’t click through an Eli 1.0 to Siphon without losing your valued resources. As such, I’d recommend picking between resources like these and Same Old Thing and not mixing the two. Though Same Old Thing doesn’t necessarily need to be Siphon 4, 5 and 6, it’s definitely one of its redeeming factors. In short, Gabe should be built fast, aggressive, and also should try to spread the Corp as thin as possible. As well as helping the speed/aggression, it ensures you’ll keep getting those Gabe credits for a lot longer than you otherwise would, and maximises his ID. The differences between a Gabe and (aggressively built) Andromeda decklist are getting more and more expansive as time goes on, and FFG adds to the (currently unfortunately small) card pool for customisation in a standard aggressive Criminal deck. Andromeda should look to get an efficient rig going turn one (or the means to do so quickly) and leverage that into disproportionate amounts of efficiency for the stage of the game that it’s in – her ID doesn’t reward her for being on top of the Corp nearly as much as Gabe’s does (though both are rewarded in accesses). Andromeda can keep up with the Corp and make her own money, but very rarely whilst accessing cards, too – she needs cards like Security Testing and/or Kati Jones maintain a credit lead/keep up in money. Sneakdoor Beta is a lot worse out of Andy than it is in Gabe, as a quick example, and is an example of a card you probably want three of in Gabe but probably not more than one in Andy. How Do You Build A Modern Gabe List? 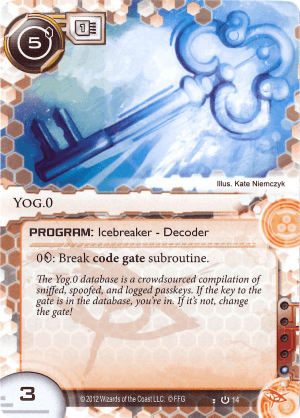 First, we need to talk about Code Gate breakers. Ah yes, the problem for Criminal (and Anarch) that needs its own paragraph. After Lotus Field hit in Upstalk, Yog.0 has been less desirable as a runner’s sole Code Gate breaker, despite it working extremely well with an aggressive playstyle like you want to play out of Gabe. So, what’s the solution? Send Lukas thousands of emails about how Quandary has ruined your life? Don’t despair, fellow runners, there’s a solution yet! Passport was a great addition to the Criminal kit when that hit out of Honour and Profit, breaking Lotus Field for a reasonable three credits, the same as Gordian Blade. However, unfortunately for us, we can’t use Passport on remotes. Of course, Gordian Blade + Passport is a very solid breaker suite, but that costs three influence a pop, and isn’t much better than Passport most of the time. Some Criminals have been looking towards Cerberus “Rex” H2 for their remote server Code Gate breaking needs, but I’m not a huge fan of Rex in Gabe. Despite it being an excellent breaker (and still good in Gabe), I think Gabe, more than any runner, needs to be able to use breakers as they’re in his hand, and any turn you’re not getting into HQ is every turn Gabe’s ID is worse; as such, I don’t want to draw a breaker that it’s probably bad for me to use on HQ. So what’s left? Well, I’m sorry to say it’s basically only Peacock and Zu, with Peacock having similar efficiency to Zu on most things but costing no influence. Peacock is more than passable for a lot of ICE (breaking Tollbooth for the same as Gordian, and costing 4 for Lotus Field, the same as Zu), though it folds against ICE like Merlin or anything massively multisub. This is where one of the best cards I think Gabe can splash for at the moment comes into play – Parasite. An old favourite for every faction, Parasite can deal with the pesky Quandary on remote whilst strengthening other things about your matchup. So Parasite’s a key player in my standard Gabe list and I feel like Parasite + Datasucker in Gabe is extremely well positioned at this point in time, even with Lotus Field. Remember how I said Gabe was all about keeping the pressure up? Making sure it’s profitable to run HQ and make a profit from it? Parasite does all that and more – it can stop you having to find and install a breaker for HQ so you can Siphon it next turn, and more. Parasite also helps in a way not dissimilar from Sneakdoor Beta, too – it spreads the ICE thin. Without Sneakdoor and Parasite, the Corp would have roughly 50% more ICE to slap down on HQ and R&D. In short, this makes those servers cost (very) roughly 50% more, and of course means you get less accesses, Desperado money, and all of that. Parasite is great against Sentries like Komainu and Tsurugi – two taxing, low strength sentries usually found in Replicating Perfection, and NEXT Silver, too – and both the NEXT suite and RP are very popular right now. Parasite isn’t great against Blue Sun (as they can yank their ICE back, trashing your Parasite), but you can still kill ICE the help of Datasucker (on the same turn), and Parasiting Archer (a common three-of) is still good for you – they don’t want to sacrifice another agenda. At the point you’re running Datasucker, you almost certainly want Mimic, too, an already great breaker (probably *the* best Sentry breaker) that breaks Komainu, Tsurugi, Architect, and a bunch of other goodies at an extremely efficient rate whilst costing a low amount to install – perfect for Gabe. Though this isn’t really advice solely about Gabe, it’s worth mentioning. In Criminal, I always try to have two of each type of breaker (ignoring Faerie as that’s disposible). It means that if one of them is destroyed, you’ve not lost, and also that you can consistently draw your breaker without having to use Special Order on it. It’s really nice to have breakers in hand as Gabe and stops you having to spend more time and money to Special Order for them. I’ve tested with Clone Chip over a second Corroder and even with the fact you can recur Parasites, it wasn’t worth the influence a lot of the time when it would otherwise be a Corroder – it means if you draw it early game, instead of being able to break into their servers, you have a better mid to late game; not what you want as Gabe. 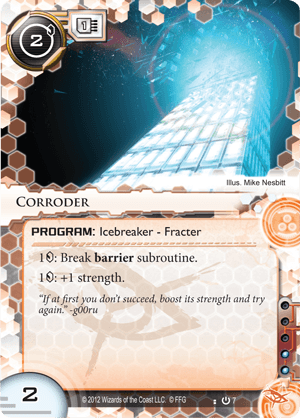 For the breaker you need most of all to get into their servers, Corroder, it’s nice to draw it early, it’s nice to have a backup (especially as for small, early game ICE like Wraparound and Ice Wall, it’s far better than Breach), and it’s nice not to need to Special Order it all the time. A noteworthy mention however goes to Breach, which breaks Curtain Wall and Hadrian’s Wall for 6 (less than Corroder in both cases). It makes the Blue Sun matchup better but pretty much every other matchup worse, since you have to Special Order your sole Corroder when they start wanting to score behind a Wraparound. The Blue Sun matchup is good enough, and you simply don’t want to have a Breach early on against most factions – you’ll be paying double what you normally would for their servers with a Corroder. In Gabe, where you want to draw into your breakers (so you’ve less time tutoring, more time running), and don’t want to lose because you made a run without Faerie and got hit by Grim, don’t go below two Corroder. If it wasn’t any influence, I’d consider using (and I’d most certainly test) three. The swing of the meta has been very kind to Gabe, and you should be mindful of that when deckbuilding. Inside Job and Emergency Shutdown are already very good cards in Gabe and help, once again, to increase aggression and spread the Corp thin. It just so happens that these cards are great against Blue Sun, a deck that has started to do really well in the past and one that Gabe would struggle against without these cards. 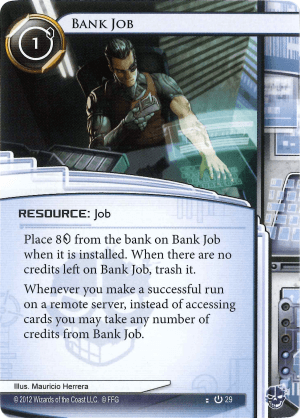 Not only that, but Bank Job can essentially be a double that gains 8 (assuming Desperado) against Near Earth Hub and similar horizontal decks – or indeed, all decks that play open assets, which after cards like Daily Business Show that all corps want their hands on, are most of them. It’s often not horrible to break ICE for it, either – as long as it’s not something massive, even if you click through Eli you essentially gained 8 in 4 clicks – the same as Day Job. This sort of burst econ really helps aggressive decks find their feet early on, and its tempo works great with Gabe (but the card’s so good right now I can see it in Andy too, even if it’s a bit worse there). 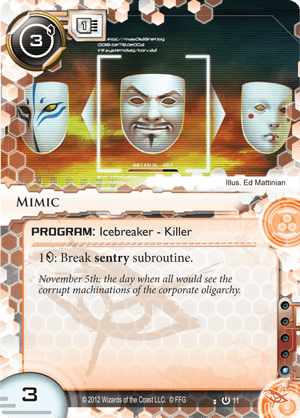 I have to say, Bank Job has only been a dead draw against Tennin – who run no remotes – against every other deck I find a use for it; I continue to be impressed by that card, even against factions with low amounts of remotes. 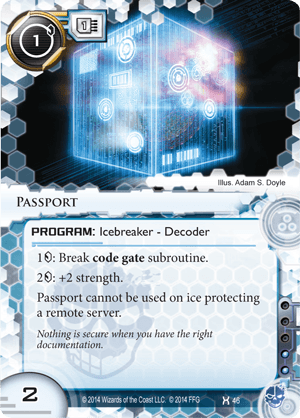 Near Earth Hub is also a low ICE deck where HQ accesses are important early on – something you can exploit with Sneakdoor Beta. Though I think this is a relatively uncommon opinion (so take it with a grain of salt), I’m not a huge fan of Security Testing in Gabe because its benefit is over time as opposed to an instant burst like Bank Job (though nothing says you can’t use both), and Gabe’s NEH matchup is already amazing (compared to other runners, at least). Though you shouldn’t necessarily shy away from great cards like Security Testing and Kati Jones (three credits for a click is not to be scoffed at), each one you have makes you less good at being aggressive early on and makes the deck have more of a late game, increasing the Probably-Better-In-Andy™ factor of your deck. An exercise you could do if you’re unsure is play out in your head what would happen in a game you draw the card, and if it contains waiting until some turn in the future (even if it’s next turn) – be wary about the card! It doesn’t mean don’t include any non-instant card, and in fact, including cards that keep up a strong tempo (John Masanori and Security Testing) can be sometimes exactly what a Gabe deck wants, but again I advise caution – you’re making a Gabe deck, you’re not making an Andy deck, and improper caution and just including “cards good in Criminal” may just result in an Andy deck with a worse ID for that deck. I’d advise you to be wary about cards which get significantly worse if you want to go Tag-Me and just Siphon them repeatedly; as it means either Siphon is significantly worse as you have to remove tags (3 clicks for a ~14 credit swing as opposed to 1 click for a ~18 credit swing) or you’ve quite a few dead cards in your deck. This is one of the reasons I’ve turned away from Security Testing and similar after testing in my deck. So what does a finished list look like? Below is the Gabe deck I’ve been playing for months now, it has had a few changes to it over that time, but at the past three GNK tournaments I’ve gone to it has held a 12-1 record (taking first at one of them and second at another). I’m going to start with the suite of Icebreakers. 2 Corroders are in the list because Corroder is the best you can splash for in Criminal and breaks barriers cheaply and efficiently. I’ve explained the reasons for two Corroders above, but in short, you should have two breakers and Breach doesn’t fit in with Gabe’s style. Onto Killers, we’ve got Mimic as the main muscle in the suite, who can deal with most sentries you’ll come across (Architect, Komainu, Tsurugi, to name a few) without Datasucker support incredibly efficiently, and all of them with Sucker support. Ninja is not a card you should consider; it costs 7 to fully break a Tsurugi and 5 for an Architect – and though these stats get better with Sucker support, it’s abysmal without Suckers. Faerie is a perfect card for any aggressive Criminal as you can throw down a Faerie and know you won’t be got by Grim, even if you’ve not quite got a full rig yet. Femme Fatale is your Killer to pair with Mimic (and doesn’t rely on Suckers, but is a tonne better with them), which doubles as a super efficient way to deal with Tollbooths on HQ or similar. Passport is the Code Gate breaker we want to use, Peacock is, unfortunately, the Code Gate breaker we have to use sometimes; I won’t spend too much talking about that decision as I wrote a lot about it above. Onto our supplementing programs, Datasucker makes our breakers more efficient (breaking Eli for 2 is better than breaking it for 4) and our Parasites more deadly (and usable against Blue Sun). It’s very nice to get these turn early in the game as it can do as much as half breaking costs for the rest of the game, allowing even more aggression. Parasite is a crazily good card right now, and especially in Gabe, and forms a strong combination with Sneakdoor Beta, our last supporting program. Both of them help keep ICE thin and allow for even more efficient runs on HQ and R&D. Parasite, as mentioned before, does the double-duty of strengthening Gabe’s otherwise bad matchup against RP, too. 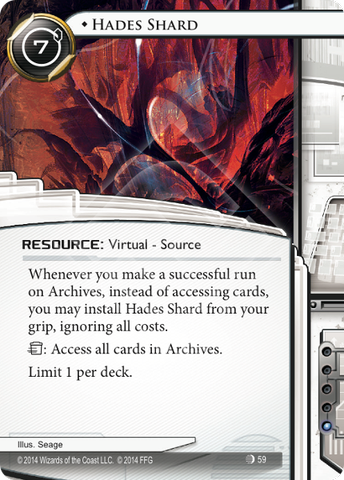 Hades Shard is a particular favourite of mine in Gabe – Corps want to Jackson agendas away from their hand against Gabe the most (and Hades Shard either gets the agendas or forces them to shuffle them in immediately, letting your time/money be used better elsewhere), but you can replace it with a Quality Time or Feedback Filter if you so desire though. The key to using it is just pretending it’s a 7c Event to access all cards in Archives (that they cannot respond to with Jackson). Bank Job is awesome and I’m not sure there should be a Gabe list without it in right now. This is almost always a double that gains 8, which is better than the two influence Lucky Find. Keep it in your hand until you can use it like a double, and it never feels like a dead draw really. When I heard about the card being used it sounded like pretty direct Near Earth Hub hate, but after playing it, it’s hard to find a matchup where it’s bad in (though its best matchup *is* almost certainly Near Earth Hub) – and if you’re sceptical, give it a try! Same Old Thing is flexible, and is often just Siphons 4, 5 and 6, though that’s not where it stops. Recurring Shutdown and Inside Job is very important against Blue Sun, and sometimes you can recur Special Order because you just really need that breaker. Emergency Shutdown is a very powerful card in Gabe to help against pesky expensive-to-rez and taxing ICE on HQ, or basically just about anything Blue Sun want to use Oversight AI on. It combos very well with Inside Job, letting you hop over a troublesome piece of ICE then shut it down until they’ve the credits to rez it again. Inside Job can really help late game too, an area Gabe isn’t well known for. It’s a card that’s often cut from Criminal decks these days and people don’t play around it as much as they used to, but it remains great against glaciers, and using them in succession can even be a great way to get around Enhanced Login Protocol. Emergency Shutdown also works fantastically well with Sneakdoor Beta. Again, if there’s something troublesome on HQ, you can get in another way then shut it down, maybe even to follow up with a Siphon to ensure they can’t rez it next turn, either. Account Siphon is the first card on the list, one of the most powerful, but also one of the least exciting to talk about. It’s a card we know and love (or hate), and its reputation precedes it. We put this card in our decks because it’s insane when we get it off. There’s not much more to say. Next to that are other non-exciting cards like Desperado, which we play three of because it’s the best console in the game for an aggressive runner and that’s about that. Sure Gamble is another card that needs no introduction, it gains 4 credits and credits are good. Plascrete Carapace is in the list because it’s good to not lose to Scorch. I can see an argument for three in Gabe (especially in a list like this) because you want to go Tag-Me a lot more than other Criminals, but two is sufficient. Finally, Special Order should also not be a surprise include. It’s in the deck because tutoring for breakers is very good, and I’m not sure much else needs to be said about it. The game starts with the decision of whether or not to mulligan, and what you’re looking for really depends which ID you’re against. I disagree with using phrases like “mulligan for Desperado” as it clouds what you should really be looking for in a hand – Desperado should rarely be mulliganed but it should be sometimes, and not every hand without Desperado in should be mulliganed – it’s not the be all and end all of aggressive Criminal hands (though it is definitely almost always a keeper). Against HB: ETF you’re probably safe with keeping Siphon and Siphoning click one. Against Blue Sun, look for Shutdown and Inside Job and/or Sneakdoor. Against RP/PE, getting a Mimic and enough credits to use it is often extremely good, too, and makes Faerie a tonne better to keep. I sometimes see people on OCTGN saying “keep” before the other has loaded their deck, and that’s most certainly a mistake; how good your hand is depends on their ID. Bank Job isn’t worth keeping against Tennin but is insane against NEH. Sneakdoor is fantastic to keep in your opening hand. The best way to know whether you should mulligan in a given deck is just by playing it a hell of a lot. The deck wants to go fast. That should already be established at this point, but it’s worth saying again. Your first turn will either run click one or two or set up with a few cards (e.g. Sure Gamble, Desperado, Datasucker) and be ready to run next turn. You want to know as soon as possible what Icebreaker you need to break their ICE. Siphon if you can but be wary of Assets like Eve Campaign or SanSan City Grid that can be rezzed before the access step to stop you getting their money – it’s far better to kill the Asset *then* Siphon. Blind Siphoning, that is, using Account Siphon when there’s unrezzed ICE, can be useful against the right deck, too. Sometimes it’s a bit of a gamble but it may be a risk you have to take. If it’s efficient, run HQ a lot. If it’s not efficient their ICE is on HQ rather than elsewhere, so run R&D instead, as they’ve likely focused on Icing HQ/Archives as opposed to R&D – you can get a lot of free accesses because of this. Unless you’re against Blue Sun or a faction without remotes, you usually want to save Inside Job for their scoring windows. You can save Femme for a remote or a bulky ICE like Tollbooth on HQ, it depends on the game state. 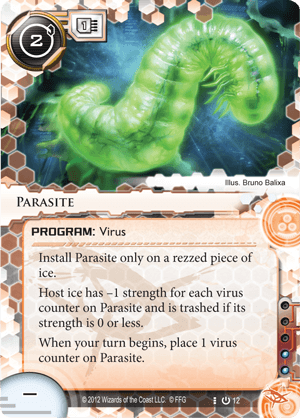 Parasite, similarly, is a card you want to save for game state, but you can be pretty happy with using it on Eli 1.0, Tollbooth, Tsurugi, NEXT Silver, or other majorly taxing ICE, especially when they’re on HQ. Other than that, an aggressive Criminal playstyle isn’t some great innovation I thought up yesterday. Most of this deck comes down to knowing what to run when and general game-sense – there are no tricks to master or combos to know. Playing an aggressive deck is hard, so practice practice practice! If you are looking for a slower list, I thought I’d provide one below. This is still an aggressive list, but I feel like if you go much slower you’re probably better changing the identity to Andromeda. This list hasn’t had nearly as much testing as the main one discussed throughout the article, and I (completely subjectively and maybe incorrectly) don’t think it’s as generally strong as the one provided above, but it’s definitely a solid list that could do you well if you wanted to play something a bit slower but didn’t know what exactly to change. You don’t need the exact decklist I illustrated in this article to have a good Gabe deck at the moment, and there are other viable courses to victory than Parasucker. However, I personally feel like this style of Gabe deck is the strongest type of Gabe deck you can make right now, and it’s really, really fun to pilot. This is also one of the best aggressive decks you can probably make right now – mainly because that’s how you should be playing Gabe – aggressively. You may want to play Gabe for a look into an aggressive runner playstyle. You could just want to have a very good NEH matchup, for which Gabe is a perfect candidate. Whatever you do with Gabe, I hope you enjoy him as much as I do!